From Dec. 8 to 28, eight of Kwantlen Polytechnic University’s Fine Arts students and graduates hosted an exhibition entitled EIGHT x EIGHT which featured their artwork chosen through an independent jury process. Students and alumni sent their work to three KPU Fine Arts professors, who chose which pieces should be exhibited at the Gam Gallery throughout the month of December, based on various criteria such as quality and balanced representation. In the past, KPU students have had exhibitions in spaces such as the Newton Cultural Centre and the Surrey Art Gallery, but according to Yuen, there haven’t been many opportunities to showcase their work in Vancouver, which he calls the “centre” of the Lower Mainland’s art community. “We are underrepresented in Vancouver, and I [decided] to take it upon myself to show people that there is community outside of it, and that we are actually competitors to consider,” he says. The EIGHT x EIGHT exhibit, which took place at the Gam Gallery on East Hastings, presented work in a variety of mediums, including ceramic, concrete, wood, fabric, oil, and acrylic paint. Alanna Edwards, who is in her graduating year, created an installation which uses both synthetic and found materials. The work is part of a larger installation featuring objects from the natural environment. Part of her installation is also currently exhibited in the Arbutus Building on the Surrey campus. 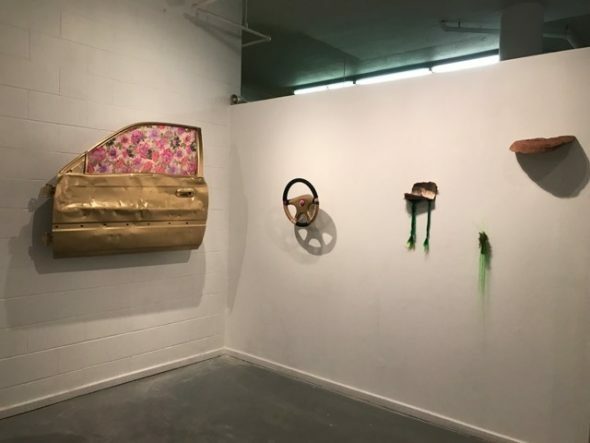 Other pieces included sculptures by Durrah Alsaif, who incorporated car parts into her work, and a video installation by Keith Harris that focused on hip hop culture and challenged the role of masculinity in it. The other students and alumni whose work was exhibited at EIGHT x Eight were Hailey Logan, Sara Grieve, and Syby Abraham. The opening night was a resounding success, as approximately 200 attendees squeezed into the 40-metre space. The artists received a lot of interest and positive feedback from their audience. The next exhibition of KPU artwork is the graduation show in April, which may also take place in Vancouver.